& from Scotland including Haddington. 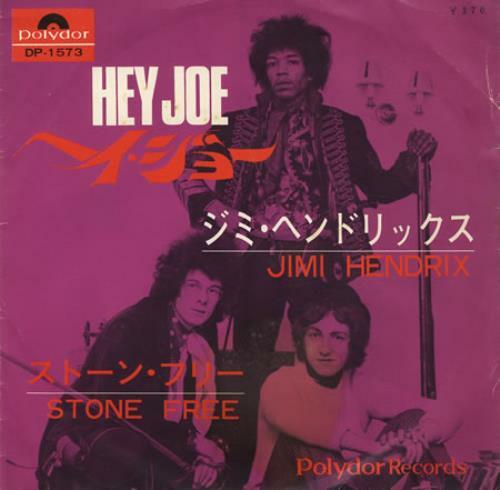 JIMI HENDRIX Hey Joe (Rare original 1968 Japanese Polydor label 2-track 7" vinyl single manufactured by Nippon Grammophon, also including Stone Free, comes in a unique flipback picture sleeve with Japanese text biography and lyrics printed on thereverse. The sleeve has only a few light signs of shelfwear with light creases, a little foxing and general light signs of age, however this does not detract from the striking cover design & there are no splits with secure flipbacks. Product Information Jimi Hendrix Hey Joe - EX Japan 7" vinyl single (7 inch record).